Kjell Norwood Lindgren (born 23 January 1973) is a current NASA astronaut. 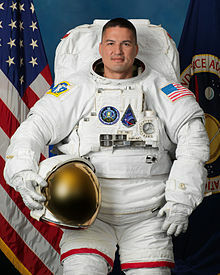 Lindgren was selected in June 2009 as a member of the NASA Astronaut Group 20. He launched to the International Space Station (ISS) as part of Expedition 44/45 on 22 July 2015. Lindgren was born in Taipei, Taiwan in 1973 before moving to the Midwestern United States, but he spent most of his childhood in England. He attended Lakenheath American High School for a year before moving back to the United States and graduating from James W. Robinson Secondary School in Fairfax, Virginia in 1991. After entering the United States Air Force Academy, he joined the Air Force Parachuting Team. In 1995, he received a bachelor's degree in biology with a minor in Mandarin Chinese from the Air Force Academy. In 1996, he received a master of science degree in cardiovascular physiology from Colorado State University (CSU), in part for his work completing cardiovascular countermeasure research at NASA's Space Physiology Lab. He also received a doctorate of medicine from the University of Colorado in 2002, and went on to complete a three-year residency in emergency medicine at Hennepin County Medical Center in Minneapolis. In 2006, he completed a post-doctoral fellowship and master of health informatics (MHI) at the University of Minnesota. He also completed a master of public health at the University of Texas Medical Branch in 2007 and a residency in aerospace medicine in 2008. He began working for NASA at the Johnson Space Center in 2007. He went on to support ISS training operation at Star City, Russia and became the deputy crew surgeon for STS-130 and Expedition 24. In June 2009, he became a member of NASA Astronaut Group 20 and completed his two years of training in 2011. Following training, he worked in the Spacecraft Communicator and Extravehicular Activity branches of NASA, and he was the Spacecraft Communicator lead for Expedition 30. In 2013, he received training at the Gagarin Space Center which allowed him to serve as part of the backup crew for Expedition 42/Expedition 43 which launched on Soyuz TMA-15M. He was later assigned to Expedition 44/Expedition 45 as a flight engineer and mission specialist which was launched to the ISS aboard Soyuz TMA-17M on 22 July 2015. This was his first visit to the ISS. In November of 2015, while on the ISS, Kjell played a set of bagpipes manufactured by McCallum Bagpipes Ltd as a memorial to Victor Hurst, who died in October of that year. McCallum Bagpipes was chosen to manufacture the bagpipes because they make them in plastic, which is easily sanitized and transported, ideal for space exploration. This is thought to be the first time the Great Highland bagpipes have been played in space. He returned to Earth on 11 December 2015. Kjell N. Lindgren will serve as backup for both the test flight SpX-DM2 and first mission crews for Dragon 2. Kjell Lindgren at the Hugo Awards ceremony at Worldcon in Helsinki in 2017. Lindgren is married to Kristiana Lindgren and has three children. He has said that he enjoys running, SCUBA diving, reading, movies, photography, amateur astronomy, working with computers, and church activities. Lindgren is also a science fiction fan, and in 2015 was a Special Guest at the 73rd World Science Fiction Convention while aboard the ISS. He participated in the Hugo Award ceremony as a guest presenter via videoconferencing, announcing Cixin Liu's win of the 2015 Hugo Award for Best Novel. He was also a special guest at Worldcon in Helsinki 2017. Lindgren was a Boy Scout and attained the rank of Eagle Scout. During the 23rd World Scout Jamboree in Japan in 2015, Lindgren talked to a small group of scouts via radio from the International Space Station. The scouts asked him various questions about daily life at the Space Station and space. A Beautiful Planet - IMAX documentary film showing scenes of Earth which features Lindgren and other ISS astronauts. ^ NASA HQ (June 29, 2009). "NASA Selects New Astronauts for Future Space Exploration". NASA. Retrieved June 29, 2009. ^ "NASA, Space Station Partners Announce Future Crew Members". NASA. 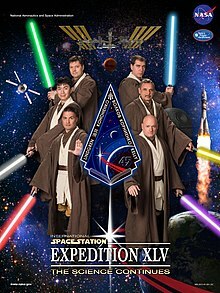 ^ "Expedition 44". NASA. Retrieved 10 June 2015. ^ a b c "Biographical Data" (PDF). jsc.nasa.gov. Lyndon B. Johnson Space Center. Retrieved 23 July 2015. ^ "NASA ASTRONAUT KJELL N. LINDGREN STARTED HIS TRAINING IN RUSSIA". Russian Space News. April 3, 2013. Retrieved 23 July 2015. ^ Klotz, Irene (July 23, 2015). "New crew arrives at space station after two-month delay". Reuters. Retrieved 23 July 2015. ^ "Astronaut plays bagpipes on International Space Station". BBC News. British Broadcasting Company (BBC). Retrieved 13 January 2018. ^ "NASA Astronaut Kjell Lindgren Completes Space Station Mission, Safely Returns to Earth". NASA. Retrieved 10 January 2016. ^ "In Their Own Words: Kjell N. Lindgren". nasa.gov. NASA. Retrieved 23 July 2015. ^ "WSJ to Outer Space". www.youtube.com. World Scouting. Retrieved September 1, 2015. This page was last edited on 2 April 2019, at 15:30 (UTC).